Lucie_0192 hasn't yet supplied information about her ideal match. This is my kind, funny, beautiful friend Lucie and I want her to meet someone who is as genuinely lovely as her. We have been best friends for nearly 20 years and we have shared many nights in, nights out, holidays, gym classes, girls weekends away and we always have the best time. Not only is she beautiful on the outside, she is also beautiful inside with a big heart. Lucie is down to earth, easy going, fabulous company and has a positive outlook on everything. 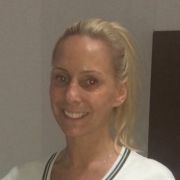 She has 2 beautiful daughters who are becoming more independent so she'd like to meet someone who is fun to be around, has a good time and is laid back she also enjoys the gym, going on runs and looking after herself plus nights out with her many friends. She really is wonderful and I would love to see her with someone equally fabulous. My family and I adore her and she only deserves the best so if your looking for the same thing then get in touch. Lucie_0192 has not yet answered any of the optional questions that would tell you more about her.